Earth is a complex system of interacting living organisms and nonliving materials. Scientists break down Earth’s major systems into four; the geosphere, hydrosphere, atmosphere, and biosphere. The geosphere, also called the lithosphere, includes all Earth’s rock, soil and sand in all its forms from mountains to its rocky stream beds, mudflats, ocean trenches, sandy beaches and lava flows. It even includes the very ground that is made up of tectonic plates forming our islands and continents. The hydrosphere includes Earth’s water. Most (97%) is salt water in the oceans. Freshwater is found in underground in aquifers, on the surface in lakes, rivers and frozen in glaciers. Earth’s water is always moving through a water cycle. It evaporates from the surface up into the atmosphere as a gas. In the atmosphere, it builds up and cools to fall back to Earth as rain or snow (precipitation). It then fills surface waterways, seeps into the soil and aquifers and flows into lakes, rivers and the ocean. The atmosphere surrounds the Earth in gaseous layers held in place by gravity. It is made up of about 78% nitrogen, 21% oxygen and1% carbon dioxide and other gases, including water vapor. The atmosphere blankets the Earth in layers. We live in the layer called the troposphere which reaches from the ground up 4-12 miles (6-20km) into the sky. This is where all weather happens from hurricanes to lightning. The next layer is the stratosphere where the air is much calmer. This is where commercial airplane fly. The next layer is the mesosphere. This layer stops most meteors as they fly toward Earth. All we see is the streak of light as they burn up. The thermosphere is next and is where the space shuttles orbited the Earth. The outer boundary of our atmosphere is the exosphere. It reaches about 6,200 miles (1,000 km) above the Earth. This is the level of the atmosphere where our satellites orbit the Earth. The biosphere includes all living things on Earth, from plants and animals to fungi and microscopic plankton. Life on Earth lives close to the surface, where it can access oxygen and/or carbon dioxide, sunlight, water, minerals and organic matter. Life on land may stretch 10 feet (3m) underground (roots, invertebrates and microorganisms) and hundreds of feet into the air (redwoods, rainforests and the living things that live on them). Most ocean life is on the surface too (photic zone), where the sun can reach down to about 600 feet (200m) and closer to shore (coastal zone). The coastal zone includes the shallow, warmer waters along the coast. It is full of nutrient-rich matter that supports 90% of all ocean life, though some life has adapted to the dark and pressure of the deep ocean. Between the ocean, land and freshwater habitats, the biosphere is broken down into biomes. A biome’s location on Earth depends upon the climate – rainfall amounts and temperature and will support living things that can tolerate and thrive in that habitat. Though we study the characteristic of these different spheres, they are all interconnected to support life on Earth. 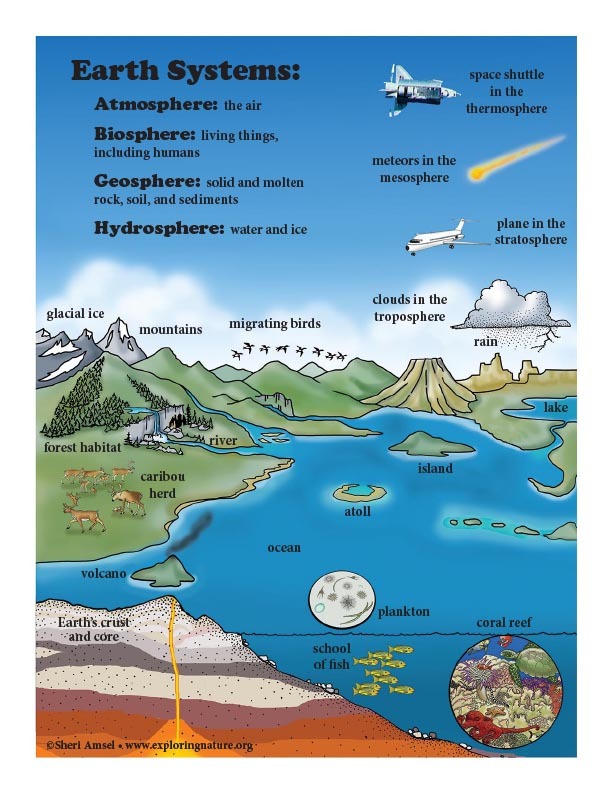 Each biome in the biosphere has some aspects of the geosphere, hydrosphere, atmosphere that helps make up its characteristics. For example, a coral reef is full of life, but it would not exist without the salt water in which it lives, the ocean floor that anchors it, and the wave action that brings it nutrients and oxygen and are created by its nearness to land. The rainforest is another biome that is rich in plant, animal and other life (biodiversity) due to its warm temperatures and abundant rainfall. It supports extensive green plants that pump out oxygen. The soil is shallow but roots some of the tallest and most exotic species of tree on Earth. Even hot, dry biomes, like the American desert, host lots of wildlife. Some adapt by burrowing underground to escape the daytime heat and are active at night (nocturnal). It rains rarely in the desert, but when it does, the water awakens flowering plants that bloom and make seeds for another life cycle. All over the planet, the different biomes are examples of how the biosphere interacts with the geosphere, hydrosphere, and atmosphere to create our living, breathing planet.